Keep yourself precise and in style with Fossil Scarlette, featuring a chronograph watch with three subdials, a stone set bezel and bracelet for more secure wearing. 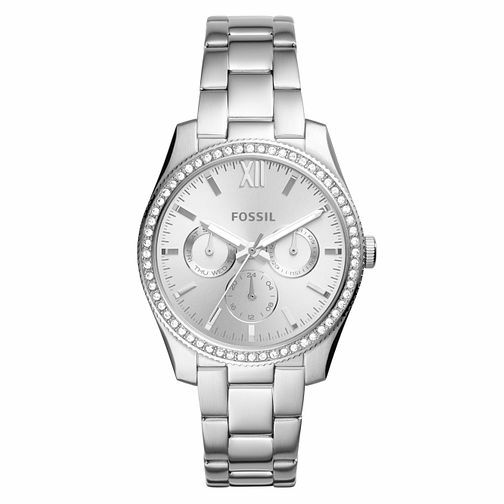 Fossil Scarlette Ladies' Stone Set Bracelet Watch is rated 5.0 out of 5 by 1. Rated 5 out of 5 by Anonymous from Really pleased with product Initially I was concerned about the size of the face (I ordered online) but I’m really pleased with it. I took it into a shop to get some links removed, which was done immediately and without any hassle. Staff recommended that any product brought online should be taken into store to ensure guarantee is valid. A tip for future online purchases.